Let’s begin this week’s post with excerpts from a recent article written by Uzay Bulut, a journalist based in Ankara, Turkey, who was born and raised a Muslim. In last week’s and this week’s Eye of Prophecy articles, we’re expanding what Uzay Bulut calls political Islam by examining and establishing the religious correlation between mainstream Islam—middle-of-the-road moderate Muslims—and the more radical among them. Then by guilt through association, the observable connection between political and religious Islam and Muslims. Indeed, it is virtually impossible to separate the two; because the Koran doesn’t distinguish between Islamic political and religious decrees or demands. Although the number of Islamic militants (including the actual terrorists among them) is relatively small, the prevailing belief of Muslims the world over is that the Koran not only encourages submission to Islam by force if necessary, but actually demands it. The practical painful result of this religious government can vividly be seen in the Middle East through brutal enforcement of Islam by terrorist atrocities; and to a lesser (in terms of the level of violence) but nevertheless large-scale implementation of Sharia law by national governments, such as Iran, Saudi Arabia, Syria. And Turkey is becoming more and more Islamic in its daily administration of national affairs. Only Messiah Jesus can and will one day establish an absolutely Divine Government on this earth, one that will bring universal peace and prosperity. Indeed, he will administer the Kingdom of God on the earth, and the entire world will be the better for it. Read with me the inspiring prophecy from Isaiah: “The government will rest on his shoulders … His government and its peace will never end. He will rule with fairness and justice from the throne of his ancestor David for all eternity. The passionate commitment of the Lord of Heaven’s Armies will make this happen” (Isaiah 9:6-7). This magnificent Kingdom will be in its purest form a Divine Monarchy, based on God’s truth and justice. But until that time, Jesus, himself, recognized the necessary distinction between governmental administration and personal belief and conduct; between man’s individual interaction with God and his collaboration with the lawmakers and law enforcers of the land, when he said, “Render to Caesar the things that are Caesar’s, and to God the things that are God’s” (Mark 12:14, NASB). This was an amazing response (one of many) given by Christ. The implications include acknowledgment that God is ultimately in control, but that he allows and even ordains that men shall be governed by higher authorities. With the strong inference that (given the fallibility of man) governments and administrative authorities cannot successfully legislate morality or spirituality, nor should they try. Meaning the Ten Commandments, as an illustrative example, came directly from God, not from a king or human ruler or government official or even a constitution. A constitution can and should reflect divine values from the true and living God of the Bible and enforce the legislative laws of the land; but a constitutional government of any kind (monarchy, parliamentary, democratic or representative republic) should not dictate its own (dictatorial) scruples, whether religious or secular, whether godly or ungodly. That belongs to the individual, and that person’s relationship (or lack thereof) with Almighty God. Scripture is fundamentally clear that it is impossible for man (without God’s direct and personal authority through Messiah Jesus) to establish and execute a governmental system built on and from a religion, which is exactly what the Roman Catholic Church and the Islamic Caliphates have attempted to do down through the ages, often with tragic results. Even the Mosaic and Levitical laws (decrees, regulations, commandments) handed down by God to the Israelites were designed for two purposes: (1) A God-like high standard of excellence for human interaction, but also (2) to demonstrate to the Jews and all of mankind that they could not effectively keep God’s laws, either individually or nationally. That only Jesus Christ perfectly fulfilled the law and, thus, qualified as God’s divine sacrificial offering for the sins of every man, woman, and child. Likewise, with an irreligious, agnostic world view that produces autocratic state controlled governments such as Communism or Fascism that has generated exponentially more wide-spread death and destruction. A Republic is the best form of a man-made government, as it allows representation of the people to the government and government to the people. But even a republic will pale in comparison to a Divine Monarchy administered by a benevolent King. A King who is the King of all kings, Messiah Jesus. *See Eye of Prophecy article, Kingdom of God, published 1-17-15 under the category of The Rapture. To dismiss out-of-hand the reasonable conclusion that Islam is not a religion of peace or to rationalize that Islamic terrorism is only (simply) a twisting of the Koran, displays an obvious ignorance of what the Koran commands its followers to do. Which is to kill infidels who refuse to convert and/or severely discipline fellow Muslims who fail to practice Islam (as interpreted by whatever sect they belong to, Sunni or Shi’ite) as it should be practiced. Moreover, the latest effort to try to explain why Muslim militants are or become terrorists, is to hypothesize that (in addition to the reasons cited by Usay Bulut) they are no different from any other religious fanatics who have used violence to achieve their objectives. Granted, the degree of violence is virtually the same, but not the foundational and motivational conviction that generates this belligerence. That is where we must make the distinction. If anyone attempts to, for example, compare the Crusades with Muslim terrorism in order to establish a position of moral equivalency between the two, then it’s imperative that they first contrast the Crusaders with true Biblical Christianity. This was done at some length in last week’s Part I article in general terms, but with a specific historical example of the Israelites conquest of the land of Canaan … the Land of Promise given to them by the true and living God. Then an equally insightful comparison between Muslim extremists and the doctrinal decrees of the Koran that unmistakably demonstrate a causal connection, i.e. Islamic creed carried out in gory detail by militants who view themselves as mainstream Muslims … enforcing the will of Allah on all who are not ready or don’t want to submit to the regulations and requirements of Islam and the Koran. And what can a so-called moderate Muslim say or do in response to such cruel enforcement? The gloomy conclusion is … not much. Fortunately, there are a handful of Muslims who have spoken out boldly against Islamic violence. Unfortunately, they are few and far between. Because to unduly criticize the implementation of Sharia law (by force or otherwise) is to confront the Koran itself, which is tantamount to challenging their god Allah. The contextual, historical comparison that needs to be made between God’s instructions to the Israelites to vanquish some of the original tribes of Canaan and the commands from the god of Islam found in the Koran is this: The Old Testament provides an account of a particular historical episode at a specific time in Israel’s (beginning) history, for a precise duration of time, for a special purpose. The Israelites were to be the instrument of God’s judgment on a very perverse people while taking over a relatively small portion of the earth (all of which belongs to God in the first place) to live and serve God. Whereas, the Koran’s instructions to all Muslims is a perpetual edict (to subjugate Christians and Jews and kill them if they don’t submit) that has no historical parameters, no national boundaries (world-wide), and is to continue indefinitely. It is, in effect, an unlimited Koranic license to suppress and kill infidels, i.e. all who refuse to become Muslims. There is a world of difference between these antithetical models. Time does not permit an in-depth analysis (indeed, books have been written on this subject), but the historical evidence is quite strong: First, the vast majority of these Crusaders were acting on behalf of the Roman Catholic Church, the Pope, and French and English Kings who were, for the most part, subject to the Pope. 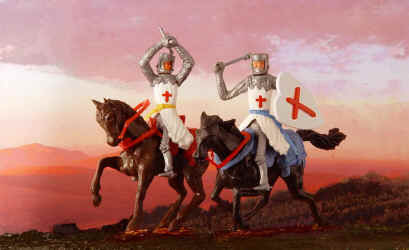 These crusades in no way, shape, or form represented the essence of Jesus Christ or Scripture. Which is to spread the Good News of salvation to all mankind, with the crystal clear understanding that this is not done through violence or even by duress. Just the opposite: As any kind, caring parent wants their child to respond to their love with love and appreciation from the child (not out of threat or even obligation), so does our great God and Messiah Jesus give us the same choice. Thus, it’s a matter of the heart, not of the sword. An issue of gratitude, not attitude (brashness and arrogance that leads to compulsive compliance). For a more in-depth examination of the history of the Holy See, I would encourage you to read the six-part Eye of Prophecy series entitled, The Woman and the Beast, published 10-12-13 through 11-16-13, under the category of Antichrist. Then, Wiles of the Woman, published 4-5-14, under category of Current Events. The Crusader’s might makes right mentality is not much different from modern-day Muslim militants or Islamic national governments such as Iran. In that respect, the proponents of religious moral equivalency are somewhat accurate. But also with a huge difference: Conversion by force and death for noncompliance is mandated by the Koran; thus, the greater number of Muslims the world over tacitly sanction the inhumane methods employed by Muslim terrorists, even though this “silent majority” would not actually participate in these killings and violence. Nevertheless, they are covertly complicit by their reticence and overtly guilty by association when, for example, thousands danced in the streets after the terrorists crashed hijacked planes into the twin towers and the Pentagon on 9/11. The Inquisitions. Though not against Muslims, the torture and murder of Jews and later Christians who rejected the institutional authority of the Roman Catholic Church (whose erroneous doctrines of salvation through good works and sacraments are no different from Islam’s rituals of good deeds to please Allah) were every bit as malicious as today’s Islamic terrorists. 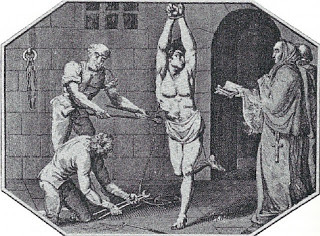 Pure and simple: what the Roman Catholic hierarchy did to Jews and Christian dissenters through the horrors of the Inquisitions, decades before the Protestant reformation, was flat-out wrong … motivated by unquestioned obedience to the self-proclaimed universal authority of the Roman Catholic Church. Personal salvation by individual faith in the finished work of Christ was considered to be heretical substitution for sacraments and Catholic catechism, and a blasphemous insult against the institutional order of this church … sometimes even treason against the State. The Triune God of the Bible has not deviated one iota from his original creative gift of free will to mankind … the liberty to choose God’s way or man’s way. As it was with our ancestors Adam and Eve in the garden, so it is to this day. Which is summarized by God’s instructions to the Israelites (and to all of humanity) through Moses: “Today, I have given you the choice between life and death, between blessings and curses. Now I call on heaven and earth to witness the choice you make. Oh, that you would choose life, so that you and your descendants might live!” (Deuteronomy 30:19). The overriding and overwhelming theme of the entire Bible is the coming of Messiah to redeem the world. Jesus Christ expressly fulfilled hundreds of Messianic prophecies, and would indeed sacrifice his very life to give all who believe in him life everlasting. “And this is what God has testified: He has given us eternal life, and this life is in his Son. Whoever has the Son has life; whoever does not have God’s Son does not have life” (I John 5:11-12). So our Creator gave us life, then he gave us life again. When we choose Jesus, we choose everlasting life. But, it’s our choice. No one can or will choose for us. Not so with Islam … administered through the callous custom of forced submission on pain of physical death and dismemberment, as well as the harsh treatment of fellow-Muslims including wives and children within both Sunni and Shi’ite Islamic sects. Nowhere does the Bible demand or suggest that Christ followers pursue a campaign of coercive conversion against unbelievers. Certainly not violence … not even verbal or written intimidation. In fact, it is just the opposite. We who have been given so great a salvation by our Redeemer are to reach out in consideration and compassion to those who have never personally experienced the love and forgiveness of our Great God and Savior Jesus Christ. Certainly, we Christians are not perfect … not even close. Nor are we better than unbelievers … not at all. But we are better off! Only because of our sure destiny of everlasting life in heaven. Thus, the Crusades and Inquisitions were disastrous distortions of Christian conduct and callous misrepresentations of God’s Word. And those who wish to cite these historical deviations as equivalent examples of militant Islam do not understand true Christianity and/or the historical facts of exactly who or what was responsible for these calamitous episodes of Christendom. Nor, conversely, do they comprehend that the fanaticism of Muslim radicals is not an aberration of Islam. Because the Muslim god, Allah, through the Koran, explicitly commands Muslims to maim and kill all infidels, which Mohammed specifically identified as Jews and Christians … also Muslims who beg to differ or dare to dispute the violent tactics of Muhammad and subsequent generations of his followers. Anyone with any objectivity about these issues can see that the Koran and Hadith (collection and commentary on Muhammed’s sayings), provide the fuel that ignites the fires of every terrorist group and nation. As just one example of many: The so-called moderate Palestinian Authority of the West Bank (Judea and Samaria) headed by their “tolerant” President, Mahmoud Abbas, celebrate and glorify the Palestinians who bomb, beat, stab, shoot, and run over innocent Israelis. If the killing of Jews results in death of the Palestinian “martyr” the families are given monthly stipends to compensate them for the “honorable and glorious death” of their son or daughter. Often their picture is posted throughout the West Bank or Gaza Strip as a Palestinian hero. After all, the death of a Jew or Christian is not only condoned, but actually directed by Islam’s “holy book,” the Koran. Which begs the question: Is there really any such thing as a moderate Muslim? Some say, no, perhaps because of the reasons provided in this article and others like it. Personally, I still say, yes—there are moderate Muslims; which, however, is giving qualified benefit of the doubt because most Muslims do not actively take part in murder and mayhem. Thus, they are moderating their belief in Islamic world conquest to the extent that they are content with their extremist brethren to do the dirty work. There are those who might even refuse, if pressed into service on the pain of death, to take part in murder of a Jew or Christian or a fellow Muslim belonging to a different sect, simply because down deep they knew it would be wrong. What then can or should we do about Muslim terrorism? Though a loaded question, the truly Christian answer is fairly simple: Individually, we are to love each and every Muslim and pray for their salvation, no more or less than Jews, Europeans, Russians, North & South Americans, Africans, and our next door neighbor. As a nation, however, we must use whatever means necessary to stop terrorists in their tracks. This includes terrorist cells like Hamas and ISIS, as well as entire nations that support and fund terrorism. Stopping Iran’s nuclear ambitions is paramount, but so is halting their export of terrorism in the Middle East, through proxies like Syria, Lebanon, and recently the Houthi in Yemen. Scripture is profoundly lucid that an individual and a nation has the right to protect themselves reactively or even sometimes proactively against an enemy sworn to kill them. All the while turning the other cheek to those who insult us BECAUSE OF OUR FAITH IN AND TESTIMONY FOR JESUS CHRIST. Unless the heart is changed and freed from the chains and penalty of sin that imprisons us, there can be no (real and lasting) external transformation of a person’s behavior. Faith without works is ineffective and questionable at best. But works without faith (in the sacrificial death and resurrection of Jesus Christ) is a one-way ticket to hell and everlasting separation from God. If God, himself, gives every person the inherent right to voluntarily choose Jesus Christ as their personal Savior; thereby, choosing eternal life over eternal death, how can anyone, especially true Christians, think or do otherwise? Compulsory Christianity is not Christian in form or substance whatsoever. We preach, we teach, we give, we pray, we love because Jesus first loved us … all this because we are grateful for our salvation. And, because we still live in these earthly bodies, we all too often make mistakes, sin, and fail our Lord. But he still cares deeply. He still loves unconditionally. So we love him back, pick ourselves up, and start helping others some more. On the other hand, coerced, bullied, and forced submission to Islam is a basic tenet of the Muslim belief, and is practiced by Muslims, both moderate and militant the world over. In the recent brutal killings in Kenya, the Islamic terrorists asked their victims: Are you Muslim or Christian? What answer do you think led to their deaths? Which is the way of war and which is the way of peace? The recent P5 + 1 deal with Iran is not much different from a treaty, which God warned the Israelites not to make with certain surrounding nations, whose religious and cultural practices were an abomination to God. A treaty could lead to compromises that would destroy ancient Israel from within and without. No different than in today’s world; except it’s the United States and other notable nations striking perilous agreements with rogue nations that can mean potential annihilation of Israel through an Iranian nuclear strike. And doing so without regard for Israel’s concerns for a “much better deal,” or no deal at all, or the ultimate recourse … a preemptive military strike against Iran. “But there is no peace for the wicked, says the Lord” (Isaiah 48:22). According to the Prophet Zechariah, the day is soon coming when, “Many peoples and powerful nations will come to Jerusalem to seek the Lord of Heaven’s Armies and to ask for his blessing” (Zechariah 8:22). When the President of the United States and many Democrats snubbed Prime Minister Benjamin Netanyahu’s address to the US Congress in early March, including his warnings of a nuclear-armed Iran, it was evident that they were not seeking God’s providential blessing by listening to and blessing (supporting) Israel. But the day will come when, “men from different nations and languages will clutch at the sleeve of one Jew. And they will say, ‘Please let us walk with you, for we have heard that God is with you’” (Zechariah 8:23). But the greatest of all hope, the most enduring peace is possible only when the Prince of Peace returns. 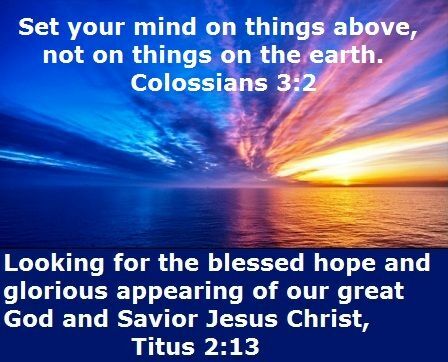 Listed to Jesus’s splendid promise to believers in him: “I am leaving with you a gift—peace of mind and heart. And the peace I give is a gift the world cannot give. So don’t be troubled or afraid. Remember what I told you: I am going away, but I will come back to you again… (John 14:27-28). “Amen! 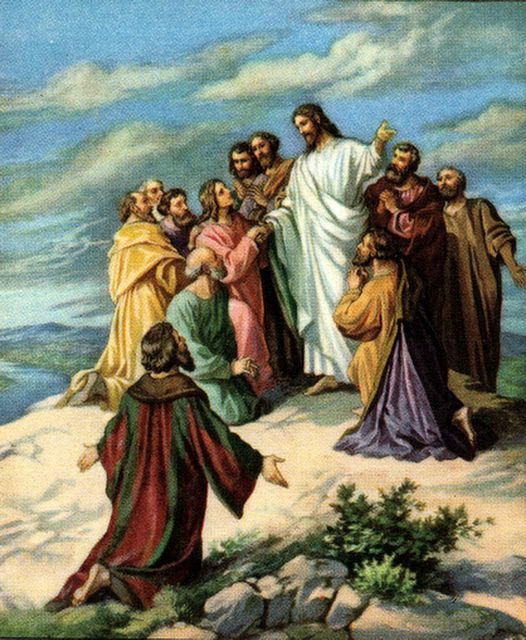 Come, Lord Jesus!” (Revelation 22:20).